Every child knows Olympic gold medals are for first place, silver for second and bronze for third. But where does this tradition come from? Like most everything else relating to the Olympics, we can trace the tradition back to the ancient Greeks, who assigned metals (not medals) to different Ages of Man. First among them was the Golden Age, characterized as a peaceful time when humans and gods lived in harmony and food was plentiful. The Greeks believed this to be the pinnacle of our existence, after which it all went downhill. Following that golden period came the Silver Age, when childhood lasted 100 years. Then, the Bronze Age, a time of violence and destruction among warring tribes. 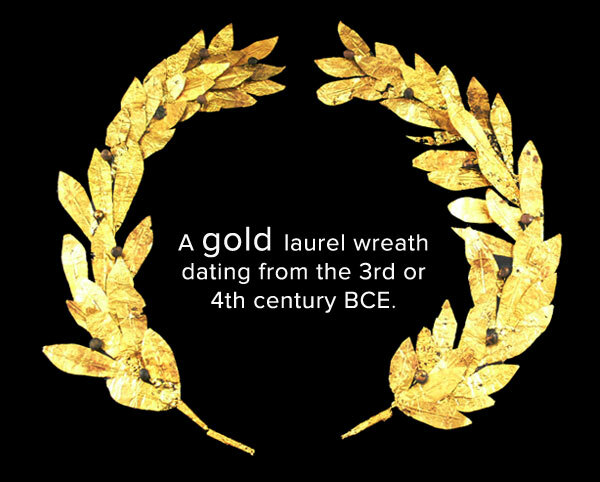 The Greeks weren’t alone in their reverence of gold, of course. It fascinates me that nearly every ancient people, no matter the continent or region, imbued the precious metal with the same degree of sacredness and purity. One of the earliest known metals, gold was valued for its resemblance to the sun, itself worshipped as a powerful deity in many cultures. The ancient Incans, in fact, referred to gold as “sweat of the sun.” When you held a gold nugget, it was believed, you held a piece of the gods themselves. Although most of us no longer believe gold emerged from the sweat glands of great celestial beings, we nevertheless still hold the metal in very high regard. This is what I often refer to as the Love Trade, the proof of which can be seen all around the globe—from beautiful gold wedding rings in the U.S., to finely crafted bridal jewelry in India, to gold coins given to newborn babies in South Korea. So high is our regard for gold that we reward the world’s most gifted athletes—our modern day Greek gods and goddesses—with a small disk of the stuff. Alas, today’s Olympic gold medals contain only a small trace of the yellow metal. According to Kitco News, they’re about 95 percent silver and 1.2 percent gold, making them worth nearly $570 at current prices. (Of course, the real value is much higher. A gold medal earned by an obscure athlete can go for $10,000 at auction, and the price goes up from there. Jesse Owens’ gold medal, awarded during the 1936 Berlin Games, sold for $1.47 million in 2013.) The last (and only) time medals were 100 percent pure was during the 1912 games in Stockholm. If this seems disappointing, it’s better than it once was. In ancient Greece, winners weren’t awarded a medal of any kind. Instead, they were crowned with wreaths of olive branches, a tradition that was observed in the first modern Olympics, the 1896 Athens Games. 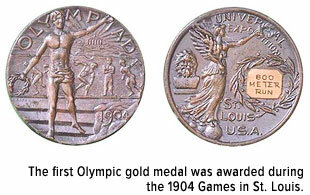 It wasn’t until the 1904 St. Louis Games that the current practice of awarding gold for first, silver for second and bronze for third was standardized. Besides the pageantry and superhuman athleticism, fans and viewers are drawn to the competitiveness that’s on display at the Olympic Games. Athletes have trained for countless hours to prepare for their events, often costing their families tens of thousands of dollars in the hopes that they will stand atop the winners’ podium and be awarded the gold medal. Likewise, many investors, myself included, gain a lot of pleasure (and heartache) watching their favorite asset classes perform in global markets—including gold. There was much heartache indeed during the recent bear market that sunk gold from its 2011, all-time high of $1,900 an ounce to its trough of $1,053 near the end of 2015. Since the start of the year, however, the yellow metal has rallied more than 26 percent, leading many analysts and brokers— including Paradigm Capital, HSBC, RBC Capital Markets and the World Gold Council (WGC)—to declare this the beginning of a new upcycle, as uncertainty over central bank policy is deepening. 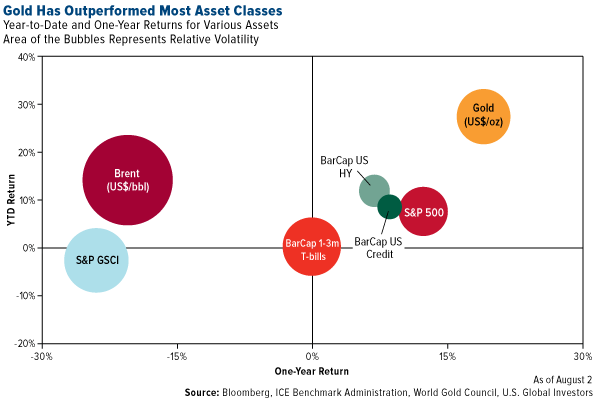 According to the WGC, gold has outpaced other major benchmarks and asset classes for both the one-year (horizontal axis) and year-to-date (vertical axis) periods of return. In addition, the metal’s volatility has been fairly comparable to S&P 500 Index stocks. (In the chart above, volatility is represented by the size of the circles.) The Love Trade is still strong globally, but much of gold’s appeal right now stems from investors’ concerns that unconventional monetary policies have not been effective at jumpstarting growth. Gold is up not just in U.S. dollars. It’s also rising steadily in countries with a major presence in the gold-mining space, including the U.K., Turkey and Russia. 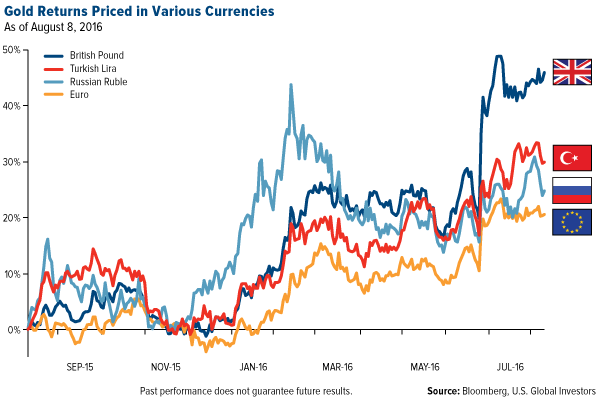 Note the huge spike in pound sterling-priced gold following the Brexit vote and subsequent currency drop. That doesn’t mean all gold funds have provided the same level of performance. Like a highly trained Olympian, our Gold and Precious Metals Fund (USERX)and World Precious Minerals Fund (UNWPX) have demonstrated a competitive edge in a cutthroat competitive space. Check out the stats: According to Morningstar data, the Gold and Precious Metals Fund ranked six out of 73 Equity Precious Metals funds for total return for the one-year period as of June 30, 2016. The fund also ranked seven out of 69 and 35 out of 50 such funds for total return for the five- and 10-year periods. As for the World Precious Minerals Fund, it ranked two out of 73 Equity Precious Metals funds for the one-year period, 44 out of 69 funds for the five-year period and 47 out of 50 funds for the 10-year period as of June 30. What’s more, USERX and UNWPX have BOTH been recognized by Morningstar, with USERX earningfour stars overall among 71 Equity Precious Metals funds and UNWPX receiving five stars for the three-year period among the same number of funds. Don’t settle for the bronze! I invite you to explore the performance and holdings of the Gold and Precious Metals Fund and World Precious Minerals Fund.